When Joachim Semrau moved to Majorca in 2001 to relax and enjoy an early retirement after a successful venture with his founded company Travel 24.com AG , the real estate market on the island was completely different than today. There were several well establised so-called “top dogs”. “Mobile Agents” that negotiated real estate without office, only with a business card and phone. Only a few companies had their own professional websites and incoming email inquiries were handled rather trivially. For Joachim Semrau, internet pioneer (Travel 24.com the first group-independent Internet travel portal in Germany) this was an incredible opportunity. However, the industry was affordable at that time, prices rose at double digits every year and for almost any property they found buyers. Joachim Semrau had already experienced how the Internet had changed the distribution of travel in Germany, and it wa sclear that the holiday property market in Mallorca would experience a similar development. An entrepreneurial challenge that excited him so much that he decided to return to an active business life. In 2005 he founded Porta Mallorquina Real Estate S.L., then the first real estate agency in Mallorca fully concentrated on internet sales. A user-friendly website, with beautiful property images and fast response times to inquiries provided the initial recipe for success. In a shop Joachim Semrau created the first headquarters which were situated at Plaza Conquistador, the marketplace of Artà, on the first floor. Easily noticed due to the billboard on which showed the web address stretched across nearly the entire width of the house: portamallorquina.com. Today, a common sight, but 10 years ago, especially in the real estate sector it was extremely rare. Joachim Semrau wanted to promote a “small but beautiful” real estate portfolio. Selected villas, villas and apartments in the Northeast were the specialty of the young company. But with the Internet came the inquiries – and the more popular and well known the site became, the more customers became interested in other regions, especially the South West. But Joachim Semrau also found a quick solution: through cooperation with other agents, he rapidly expanded its services to the entire island. Headlines such as “Market Gap Filled” were reported by the local press about the newcomer who ascended to a successful online brand for property in Mallorca after only 18 months. In parallel, its own sales network became more and more extended. Joachim Semrau then drove rapid growth through franchise, which was already successfully implemented in the “Flugbörse”, a travel agency chain also founded in the 80s by Joachim Semrau in Germany. The main distribution areas were filled with independent brokers. Llucmajor opened its first property shop in 2008. Joachim Semrau was clear that appropriate local presence must be shown by a company of a certain size. That’s why he left the original concept of “virtual broker” and developed an innovative shopping concept with prestigious brand architects, which was awarded with the title “best practice” after its introduction of a newsletter and still meets the highest industry standards. 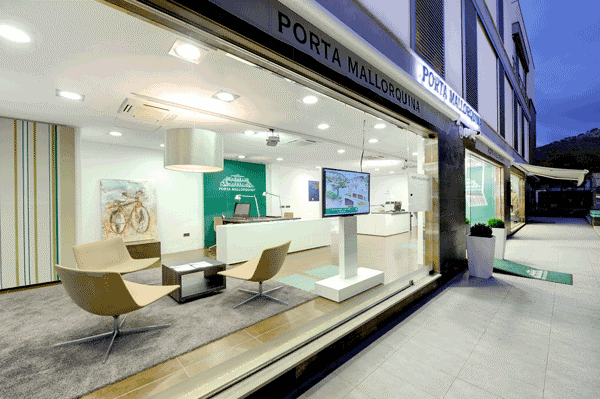 In 2008, the expansion was carried out over Mallorca and Ibiza and with Porta Catalunya a regional franchise partner, the Majorcan success could be implented in their local markets. For better control of expansion of the franchise system, Porta Mondial AG was founded as a holding company and in the same year, Porta Mallorquina was foudned as the subsidiary and master franchise. The Porta Mondial Group is now active both in Spain and in Germany. 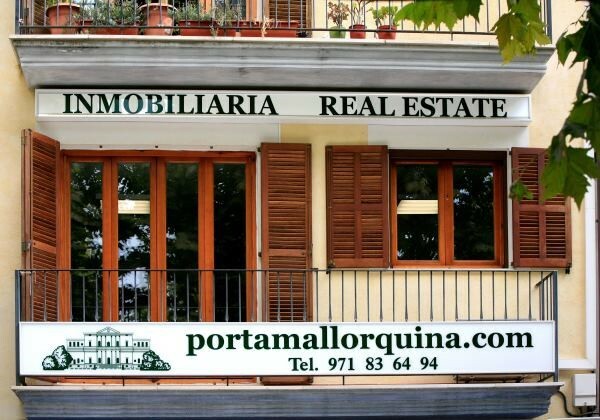 The Spanish real estate crisis in 2009 only mildly hindered Porta Mallorquina. Despite the general reluctance to buy, their own sales continued to rise, only the average sales fell slightly. The third property shop in Felanitx (now Santanyí) was established in 2010, and 2012 celebrated the opening of Santa Ponsa and Puerto de Andratx. In 2013 Palma and Pollensa follwed suit and finally the “primordial cell” in Artà was established on the first floor in a prestigious property with a shop right at the entrance. 2014 was the most successful year for Joachim Semrau and his team. 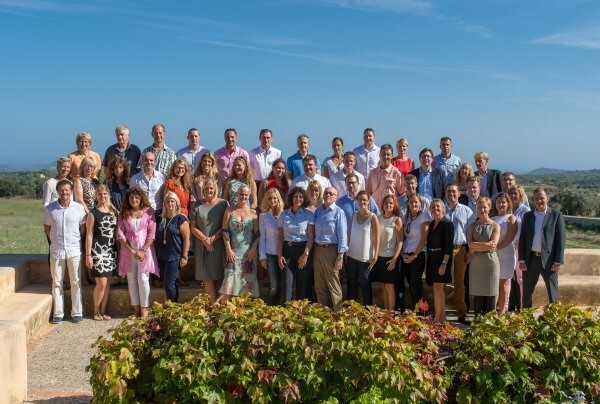 Now over 40 franchise partners, sales consultants and employees work for Porta Mallorquina and manage a portfolio of more than 2,000 real estate. The company’s headquarters is now located in Palma. The site is as popular as ever and, with up to 100,000 visits a month making it among the busiest Mallorcan real estate sites on the net. A great sign for a bright future. For Joachim Semrau even after 10 years has no reason to rest. 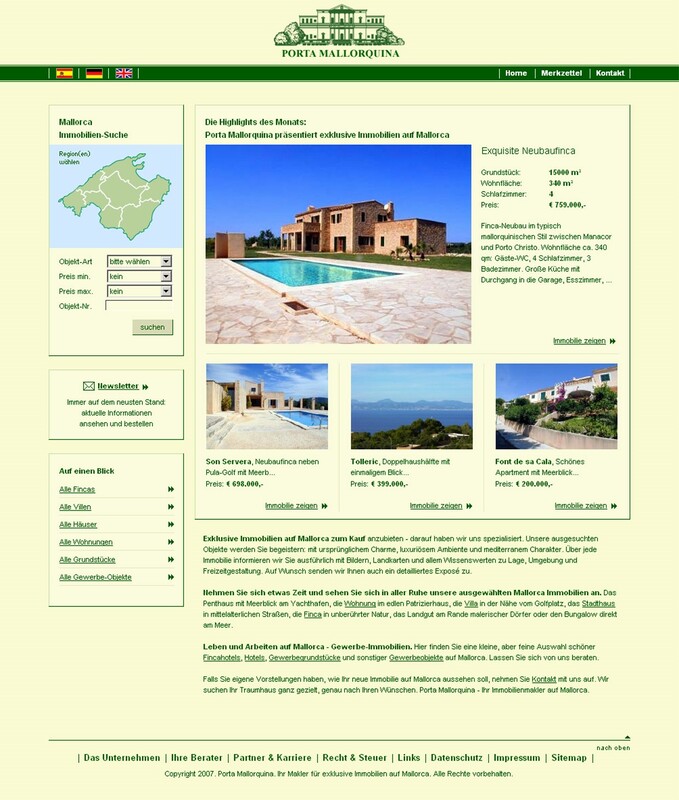 With “Porta Holiday” he has started a new project this year: Holiday rental in Mallorca. Providing the group as one of the first brokers with real estate for sale, long term rental and holiday rental avaliable from a single source. This line of business has also been developed positively, and so far, the offer is focused primarily on the north, northeast and southwest. As already successfully practiced at Porta Mallorquina, Porta Holiday plans further expansion through regional licensing partners.